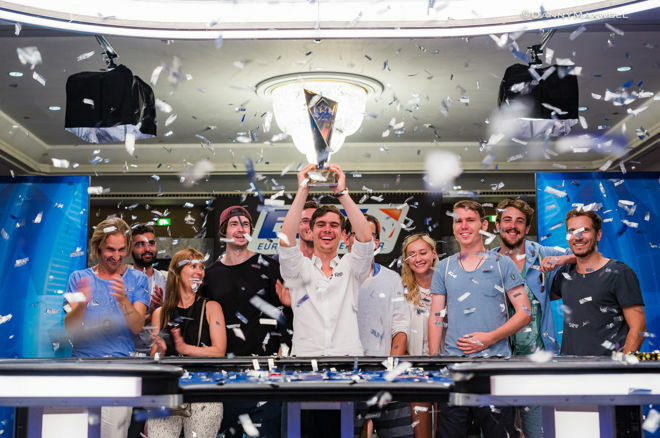 Fedor Holz wins the EPT Barcelona €50,000 Super High Roller for €1.3 million! 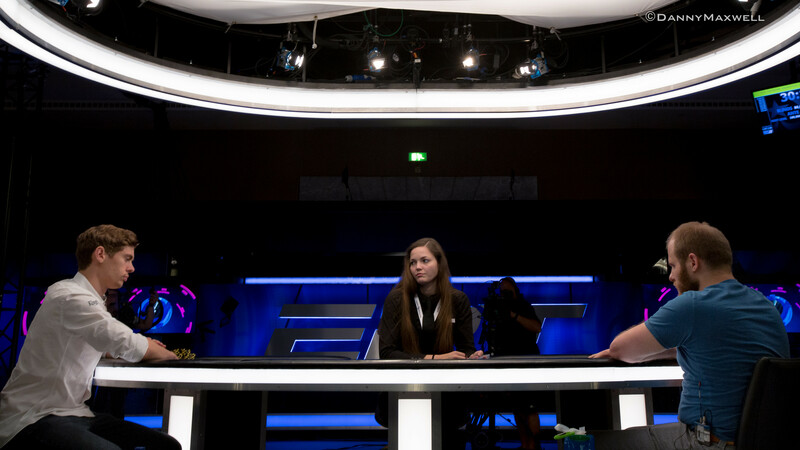 The third and final day of the PokerStars.es European Poker Tour Season 13 €50,000 Super High Roller saw nine hopefuls out of a 102-entry strong field return to the feature table. 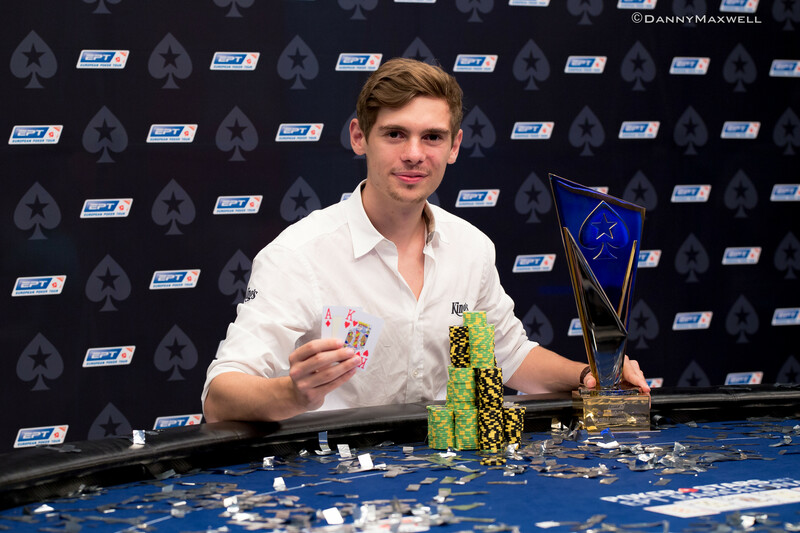 It took less than five hours for German wunderkind Fedor Holz to lift the trophy and claim yet another victory. Two-time EPT Barcelona Super High Roller finalist Erik Seidel was the shortest stack coming into the day and joined the rail in hand number 5. A crazy four-way all in saw Seidel all in with pocket nines, Sam Greenwood all in with pocket kings, Julian Stuer all in with pocket tens and Ahadpur Khangah putting them all at rish with ace-five suited. The board ran out queen-high and Greenwood won the main pot while Stuer won the side pot. Erik Seidel busted in 9th place (€137,130), Khangah was knocked back his role as short-stack. Julian Stuer took another hit soon after that hand and called all in out of the big blind with queen-deuce when facing the shove of Greenwood who held king-eight suited. A queen came on the flop but Greenwood picked up a flush draw on the turn and improved thanks to a king on the river. Stuer made his exit in 8th place for €181,200. Daniel Dvoress followed next. In a battle of the Canadians, Dvoress three-bet all-in with pocket eights and initial raiser Greenwood looked him up with pocket tens which held up on a dry queen-high board. Dvoress had to settle for 7th place, good for €232,600. Defending EPT Barcelona Super High Roller champion and former November Niner, Sylvain Loosli, was eliminated in 6th place (€293,800). He three-bet all-in out of the big blind with pocket eights. Holz, who had raised under the gun, quickly called with ace-king and won the flip after an ace appeared on the flop. Businessman Ahadpur Khangah, who beat plenty of top pros to reach the final table, bowed out in 5th place (€377,100). He was in the big blind with king-jack suited and called all in after a shove of small blind Greenwood, who held ace-seven. A jack on the flop gave hope for a comeback story, but an ace followed right away on the turn and the river blanked. Down to the last four, Alexandros Kolonias, who finished 2nd in the EPT12 Grand Final €25,000 High Roller, was the shortest stack. He got it in good with a three-bet shove holding pocket kings, but Holz's run-good continued as his pocket nines saw a third nine appear on the flop. That was it for Kolonias (4th, €467,700). Timothy Adams was the chip leader going into the final table and quickly lost a lot of chips with three players remaining. Adams then three-bet all in with pocket deuces and Greenwood called with ace-king suited. Greenwood spiked a king on the flop to send Adams home in 3rd place (€597,500). When heads-up play for the trophy and first-place payout of €1,300,300 started, the two were almost even in chips with no deal in sight. Holz quickly established a big lead and then pulled away. It was all over during hand the 75th hand of the day when Greenwood shoved his short stack in with five-six suited and Holz snap-called with ace-king. A king-high flop left Greenwood drawing to a gutshot. He turned an open-ended straight draw but didn't complete it with a blank on the river. Greenwood departed in 2nd place for €903,600. Within the last six months, Fedor "CrownUpGuy" Holz has now accumulated more than $12 million in tournament cashes and added another win to his already impressive poker resume. For a player that claimed retirement not too long ago, this trip to Barcelona has gone exceptionally well so far. The action continues at the record-breaking festival at the Casino Barcelona with Day 1a of the €5,300 Main Event. Tomorrow, Day 1b gets underway at 10:00am local time and PokerNews will also be on site for live updates from the €25,000 Single-Day High Roller Event.